My 850th review!!! I brought this one to Pre-Ffej to share with everyone, hope everyone enjoyed it. A - Pours murky brown with a nice one finger tall off white head, quickly dissipating down to a light film and eventually a ring around the edge, leaving small streaks of lace on the sides of the glass. S - Smells of dark fruits, toffee, caramel, oak, wine grapes, leather, a bit of musty barnyard funk, cherrie skins and some lactic sourness. There is definitely some oxidation there but not as much as I was expecting there to be. T - Starts off with the cherrie skins and dark fruits quickly being joined by the woody oak, wet leather, toffee and caramel sweetness, wine grapes, light must and funk and some light oxidation. Finish is quite dry, lingering long after the finish. M - Medium body with moderate carbonation. Sweet feel initially goes quite dry at the end of each sip. Booze only really creeps in once it fully warms up. O - After hearing how much this had fallen off I was expecting a lot worse so this was a pleasant surprise. Yes it was definitely showing its age but it is hardly as bad as many people make it seem. I wouldn't age it any further if you have one, drink it before it really does go off the cliff. Recieved in a trade with a most generous trader known as drawde from the other site. Thanks Colin. 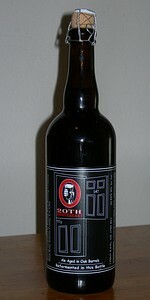 According to Russian River's bottle log this is "A blend of 5 different barrel aged ales to celebrate the great Toronado beer bars 20th Anniversary." When this beer is not backlit it's a surprisingly dark, crimson. When backlit it glows bright ruby and you can see miniscule particles suspended throughout. Moderate carbonation bubbles rise from the middle of the glass to the surface keeping it strong. A three finger frothy white head formed on the pour and faded to a thick crown. As it faded it left sheet lacing in certain spots and chunk in others. This beer has wonderful aromas of sweet and sour. There's a little funk up front and it develops into tart cherries, an earthy mustiness, and the oak glides throughout. Sometimes I find these barrel aged beers to be way over the top in the oakiness. This one is presented perfectly. The sweet makes me salivate while the sour makes me pucker. The oak brings the two together seamlessly. As this beer warms more there is a cornucopia of fruit involved. Tangerines, plum, and I believe thats some white peaches in there. As this beer warms the aroma becomes amazing. Damn! This stuff is mouthwatering. The flavor is identical to the aroma with a perfect balance of juicy ripe fruit (but tart cherries), a smooth oakiness, and the perfect level of mouth puckering sourness. The thing that most impresses me about this beer is how perfectly blended the flavors are. The oak comes in just the right amount of intensity to compliment instead of overtake the other flavors. The sourness is lip puckering for sure but in no way interferes with the complexity or drinkability. This is an impressive blend of beer. I wish I knew what the combo was. This beer weighs in at a hefty 10.43%abv and the body is incredibly light and airy. Extremely creamy and enjoyable with a puckeringly dry finish. Mouthfeel is similiar to that of champagne and I don't think it could fit this beer any better. This beer is ultimately drinkable and the only reason it's not getting the perfect score for drinkability is the big abv. Somehow there isn't a hint of alcohol in the flavor of this beer. This is some kind of honor for a bar to recieve a beer of this caliber for their anniversary. Incredible blend of beer with a great body, incredible flavor, and a perfect mouthfeel that all combine to make an exceptional sour ale.